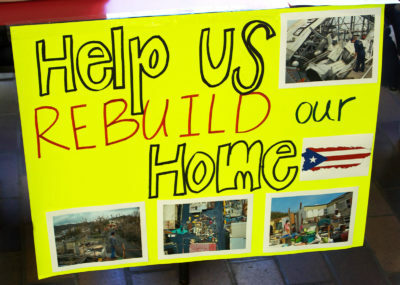 In the wake of Hurricane Maria, some Puerto Rican Boston University students organized a campus food and supply drive to gather relief materials for their compatriots whose possessions were lost or destroyed in the storm. The hurricane relief initiative began on Monday morning in the George Sherman Union lobby, where Puerto Rican students set up a booth with the purpose of educating people about the crisis in Puerto Rico and collecting supplies to be sent to the island, according to Elani Elizondo, one of the students involved in executing the drive. Elizondo helped to organize the supply drive with Terriers for Puerto Rico, which she described as “an all-inclusive title” for every BU affiliate who is helping provide relief to those impacted by Hurricane Maria. Her motivation for the supply drive was fueled by her feelings of frustration upon being unable to support her family in San Juan during their time of need. Alondra Concepcion, a Guaynabo, Puerto Rico native and a College of Arts and Sciences sophomore, said she helped found the Terriers for Puerto Rico collective because she felt it was important to find some way to help other Puerto Ricans, even from a distance. Organizers said their efforts to begin collecting supplies were hindered at first by the BU administration’s indecisiveness about how to best offer their support, Elizondo said, but Dean of Students Kenneth Elmore recently expressed his support for the drive. After speaking with Rady Roldan-Figueroa, a professor in the School of Theology who assisted students in the planning of their relief efforts, Elmore offered to provide boxes and printing materials for the drive. The Dean of Students Office will also provide the transportation means necessary to deliver the supplies to Northeastern University’s Latinx Student Cultural Center, which will manage the transportation of the supplies to the island, Roldan-Figueroa said. “We’ll support students in whatever way they think they want to provide … relief,” Elmore told The Daily Free Press. Several students who contributed to the drive said they felt it was important to come together as a community to support the Puerto Ricans in their time of need. Rodrigo De La Maza, a College of Communication junior, said he made a monetary contribution to the drive because he wanted to support the fundraising and boost awareness efforts. “I know that [many Puerto Ricans] are in a very bad situation right now, so I think it’s important for everyone to know about what’s happening in Puerto Rico … and to help them out in any way we can,” he said. Yara Gonzalez, a fourth-year doctoral student in the School of Theology, said she donated water filters, first aid kits, batteries and ibuprofen among other items because the people in Puerto Rico are desperate for supplies. Fay Kalach, a Sargent College of Health and Rehabilitation Sciences sophomore, said she made a monetary contribution, and she appreciated that fundraisers are happening on college campuses. Jessica Mandel, a COM freshman, contributed a pack of underwear and several toothbrushes to the drive and said she felt it was important to unite to help others.